Here is a little bit of their love story from Hannah’s perspective! Josh and I have known each other since middle school-- we rode the same bus! We knew of each other and have 2 pictures of us together in middle school, but we probably wouldn't have called ourselves friends. We definitely had different friend circles. Fast forward 3 years to high school, we started to become much better friends through Young Life. We went to camp together freshman year of high school and I think that is where Josh started to fall in love with me, but it honestly never crossed my mind. We both played lacrosse in high school, and after a little encouragement from our Young Life leaders, Josh started texting me after every lacrosse game asking me if we won and how I played. A few months and a lot of conversations later, we were dating! We went to junior prom and senior prom together, but when graduation came, we decided to go to different universities. After about a year of long distance, we took a break from our relationship. Two years later, we both realized that we did not want to do life without each other and reconnected at Josh's sister's graduation party. It was like starting over again, except that I was living in State College, PA and Josh was in Baltimore. We would meet in Harrisburg, PA a couple times a month for dinner and we both knew that we wanted to be together. After college, both of us moved back to Baltimore and loved the opportunity to live life together in the same city after so many years of long distance. It did not take us long to realize that we wanted to get married, and after 6 months of living in Baltimore, Josh proposed! We were at Deep Creek Lake at Josh's parent's lake house- a place that I absolutely LOVE. We were going to celebrate Christmas a few days early because I was going to PA for Christmas and Josh's brother and sister-in-law, Emily, would be with Emily's parents for Christmas. After a light dusting of snow and a comfy day inside because it was FREEZING outside, Josh asked me if I wanted to go for a walk. When we went out the backdoor to walk around the lake, I knew something was going on because we never walk around the lake. After the coldest 15 minute walk of my life, Josh stopped me and asked me to marry him! I was so happy and excited that we were engaged, but it also meant that I could go back inside! When we got back to the house, it had been miraculously transformed into an engagement party with both of our families, our high school friends, and my besties from college. I could not believe that they drove 3 hours to be there for this moment-- it was the sweetest. We spent the rest of the night celebrating, laughing, eating cake, and hot tubbing. We could not asked for anything more! Such a sweet story! 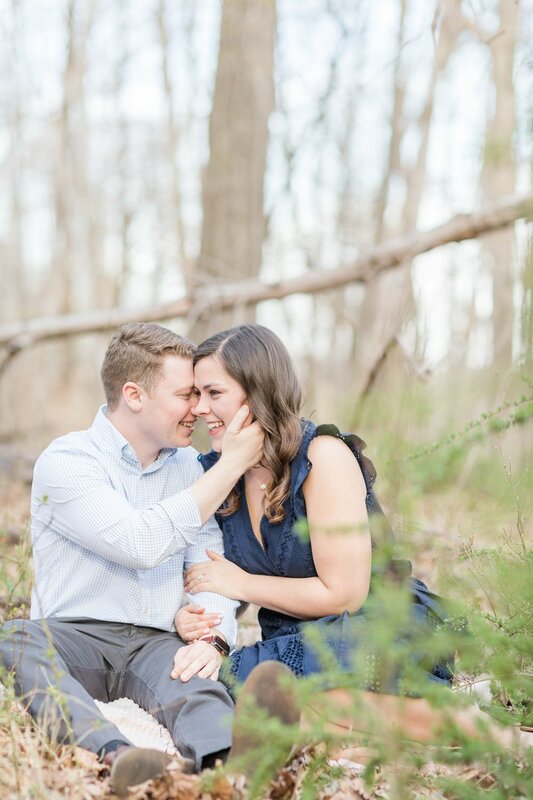 Enjoy Josh and Hannah’s outdoor engagement session at Patapsco Valley State Park! Gorgeous ring! Great job, Josh! Congrats you two!! We can’t wait for your wedding this summer. In case you missed it, check out our favorite wedding images from 2018!